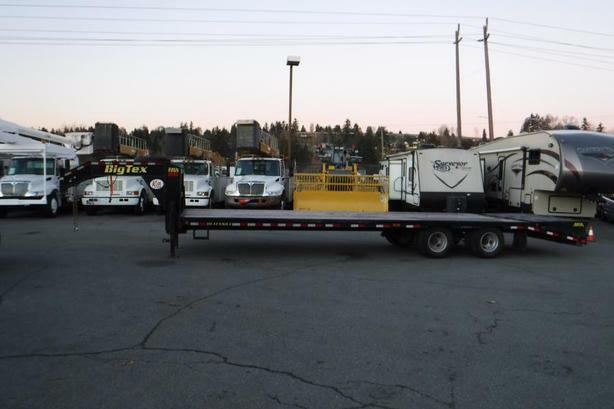 2018 Big Tex 22GN -25 BK- 5 MR 25 Foot Gooseneck Tandem Axle Flatdeck Trailer with Ramps, G.V.W.R. 23,900 pounds, SUSPENSION	Heavy Duty 30,000# Adjustable, WHEEL	16" x 6"; Dual Wheel 8 Bolt, COUPLER2-5/16" Ball Adj. Square Crank Type, black exterior. Flat deck 25 feet long, 8.5 feet wide, ramps 5 feet, gooseneck 8.5 feet long, overall approximate length 38.5 feet. gvwr 23,900lbs. Certification show valid through February of 2019. $13,930.00 plus $300 conveyance fee, $14,230.00 total payment obligation before taxes. Listing Report, Warranty, Contract Commitment Cancellation option on Fully Completed Contracts, Financing Available on Approved Credit (some limitations and exceptions may apply). All above specifications and information is considered to be accurate but is not guaranteed. Call 604-522-REPO(7376) to confirm listing availability.